Toffia (Rieti) old stone little building located in the historic center, 65 sqm covered, three floors, 1 bedroom, living room whit fireplace, kitchen, bathroom, 25 sqm terrace spectacular view, 100 sqm garden, perfectly restored, heating, dishwasher, 40 minutes from Rome. It is a splendid village in Sabina, a green region very near Rome, famous for production of olive oil. At about 40 km north-east of Rome, the area called Sabina extends from the banks of the Tiber to the Sabine mountains, part of the chain of the Appennines. 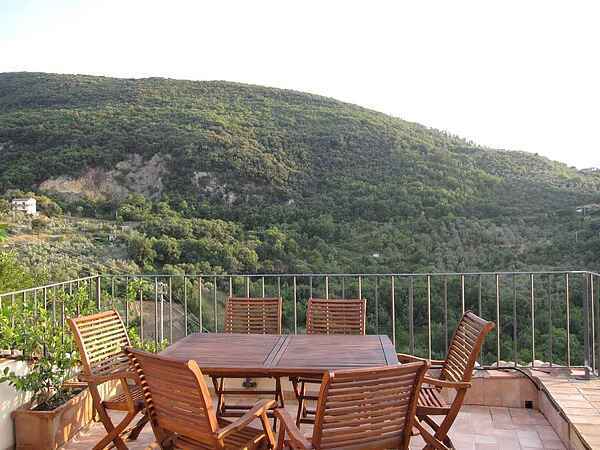 The landscape of hills covered with olive trees, with extensive forests of oaks and, everywhere, small medieval villages, castles and monasteries. It's a landscape remained largely unchanged over time and little touched by modern building development. By car: you can reach Toffia leaving the highway Rome-Florence exit Fiano Romano or Ponzano Soratte. By plane: the nearest airport is Rome-Fiumicino. By train: using the line Fiumicino airport-Orte or using the metro service Fiumicino airport-Fara Sabina. Both lines pass trough the biggest railway stations in Rome. Sabina is a land rich in culture, it is said to have given rise to ancient Rome, because Romolo and Remo were children, according to legend, of Rea Silvia, the woman who named the town of Rieti. The ancient people of Sabina came to the place where Rome will born trough Tiber river. Toffia (Rieti) old stone little building located in the historic center, 65 sqm covered, three floors, 1 bedroom, living room whit fireplace, kitchen, bathroom, 25 sqm terrace spectacular view, 100 sqm garden, perfectly restored, heating, dishwasher, 40 minutes from Rome. It is a splendid village in Sabina, a green region very near Rome, famous for production of olive oil.